HE is a dog of many talents – shop assistant, model, amateur footballer and part-time sniffer dog – now “The Schmoo” has turned his paw to charity fundraising. The three-year-old miniature schnauzer, known to shop owners, security guards and visitors to the Stables as the “Market Dog”, has worked like a dog to raise more than £100 for environmental charity Greenpeace. 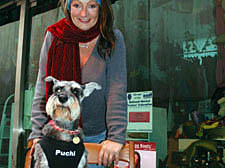 The Schmoo’s owner (and agent) Sasha Hutchinson, who runs the clothes shop Serendipity, hit upon the idea of asking for a donation every time shoppers wanted to take her pet’s picture.